Nest’s recent trip to Peru took us to a wide range of climates and regions of the country as we conducted a series of ethical compliance assessments at the artisan workshops of one of our partners. Seeing as Nest’s compliance model is predicated on relationship building and creation of context-specific solutions the compliance challenges our partners may face, these trips also foster our deeper understanding of the regional nuances that characterize the diverse crafts and cultures we visit – ultimately helping us make a more meaningful and sustainable impact. Starting in Lima, we then hopped a short flight to hot, coastal Chulucanas, a town in the foothills of the Piura highlands. Here, hundreds of artisans still actively practice the two–thousand–year–old pottery traditions and techniques of the Vicus civilization. The potters shape each piece of hand-thrown clay on a potter’s wheel like many types of pottery, but the region is known for hand burnishing the pieces with small river stones to create a smooth surface and after being dried in a wood burning kiln, the pieces are fired a second time with smoldering mango leaves to give them their beautiful blackened finish. We then we flew down to Huancayo and drove three hours through the Southern Andes mountains to the small town of Paucara, which has a population of about 2,000 people, many of whom are farmers and artisans. 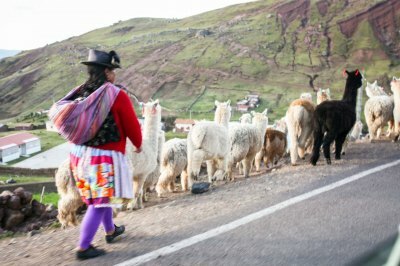 After passing herds of alpacas along the way, we finally stopped at the small workshop where roughly 20 weavers hand-weave beautiful, soft throws, shawls, and blankets with delicate alpaca yarns. In celebration of the visit, the artisans prepared a special lunch of seasoned meats, vegetables, and colorful potatoes using a traditional Incan method of earthen cooking with hot stones called Pachamanca. The last day took us back to Huancayo, the capital of the Peruvian Central Andes sitting at around 10,650 feet in altitude. The region is known for its farmlands, hiking, and craft traditions. Here, we visited another group of handloom weavers who recently moved their operations from high in the mountains into the commercial center of the region where the business operations are easier to manage. The workshop is managed by a father – daughter team who splits the oversight of the male and female artisans.